From the last blog I've made numerous adjustments, some very minor. Hopefully they have added to the painting as a whole. 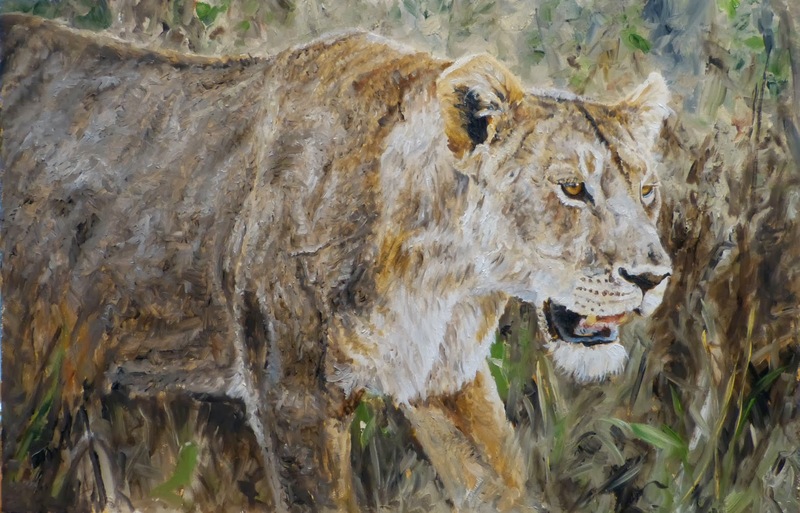 Some of them follow: added whiskers, darkened underneath the lioness's right eye, warmed up both ears and darkened outer edge of her right ear, warmed coat in general, lightened the dark spot on lioness's right front leg, added grasses, darkened head/neck intersection, darkened and added darks between the grasses, more nose definition, darker face, more length to the face's center line, some mouth adjustment, and lots of little touches here and there. One of the most difficult stages in a painting is the one right before the end. It is that last push which can make the difference between an okay painting and one which you are proud of. I have a tendency at this point in a painting to intellectualize all the elements which need to be adjusted. The grasses have to added, more warmth in the ears, whiskers etc. But I have found it is more important for me to step back and try and feel what else the painting needs. Stay tuned for the finish. One of the joys of painting is being involved with a piece. You think of little else. Unfortunately, that means you forget to take photos of it in progress to share on your blog! 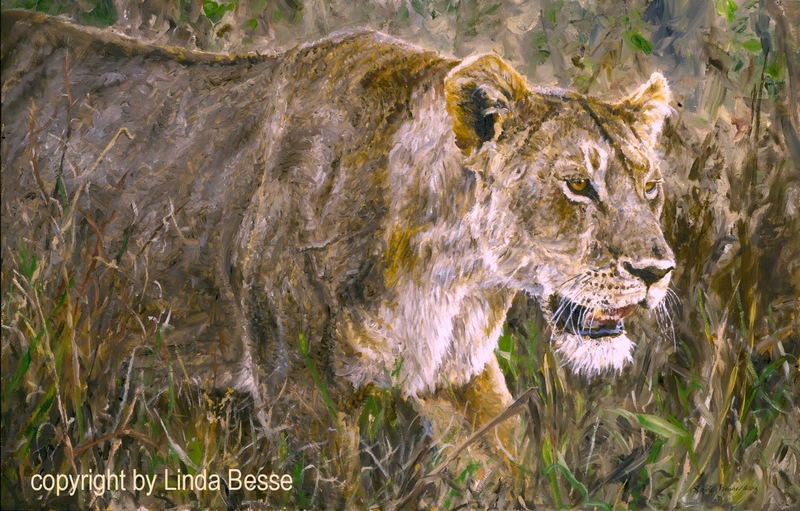 So, this morning I scanned my lioness and cubs painting. 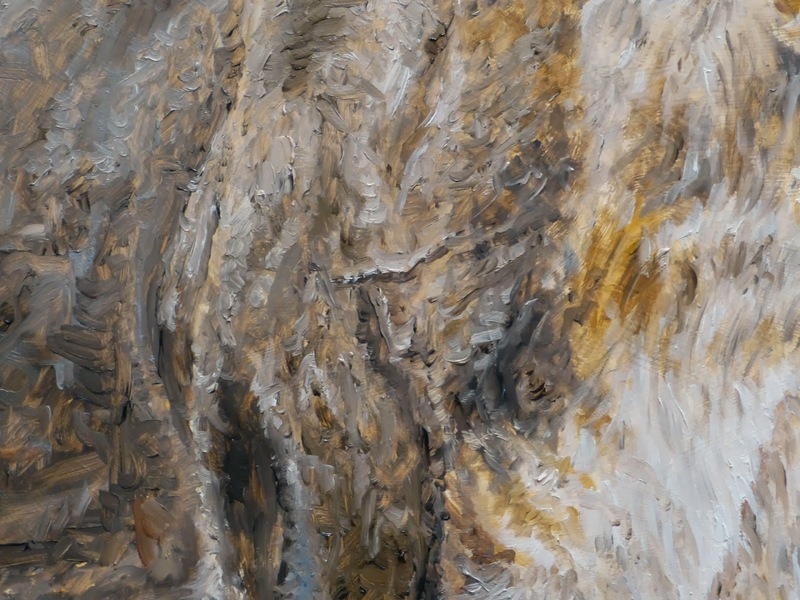 In my rush to scan it before varnishing it and running it to my framer I did not realize I had missed part of the lioness's tail in the scan. She does have more tail as shown in the previous blog. There is a back story to this piece. Just as the sun was coming up, we came across a pride of lions with a zebra kill. Most of the lions had had their fill and moved off a pace. This lioness and her three cubs (only two here) were feeding at their leisure. What the lioness soon realized is that the kill had attracted a number of hyenas. More and more hyenas began to appear and started moving in closer. They would approach as far as they dared then sit. In a minute or two they would move closer. The lioness finally decided to move the zebra carcass closer to the main pride. The cubs thought this was a grand game as they lunged and ran after their breakfast. 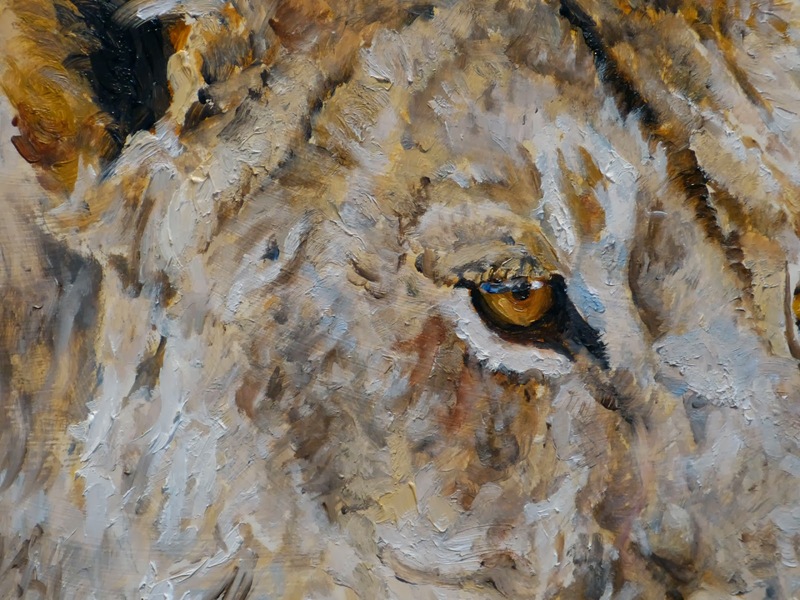 As a wildlife artist, I have a certain way of looking at the natural world. Things that others might find disturbing are for me part of the circle of life. Wondering how much of this rubbed off on my nieces, I had a chance to find out when my four nieces and nephew visited with their families at Christmas. I had to smile with the reaction of the first two nieces who saw the turpentine wash of this next painting. In unison my 8- and 13-year old nieces said, "That is so cute!" Yeah, 3 lions ripping into a zebra carcass is cute. At least, we think so. How do you decide when a more "artsy" painting is finished? When a piece is a departure from your usual style, the answer is not as clear-cut. 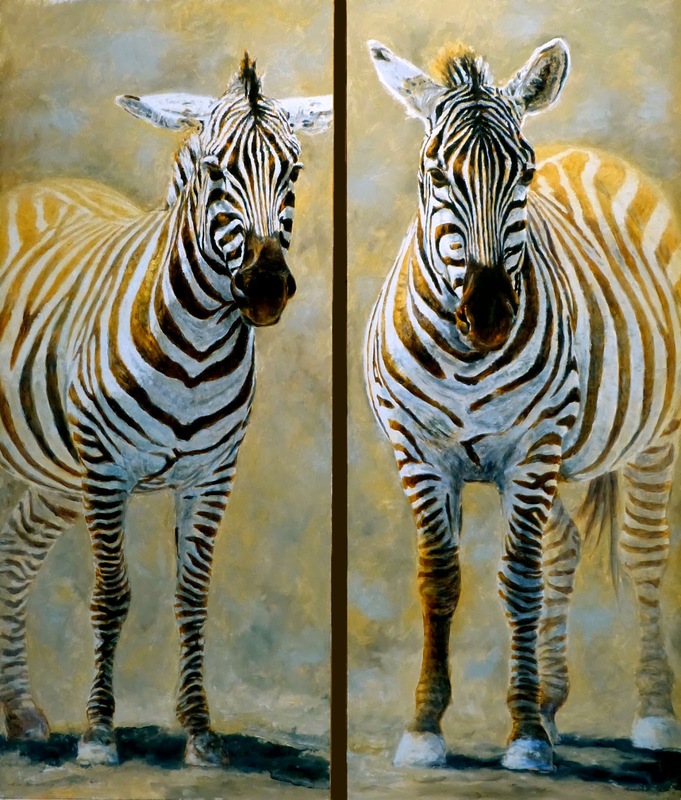 I have been glazing the zebra using liquin throughout the painting process. When is it the last coat? Several days ago I thought I was finished but when I looked at the painting the next evening, it needed just a little more oomph. One last dark glaze on the heads and I put my brush down. This was a fun diptych to paint. 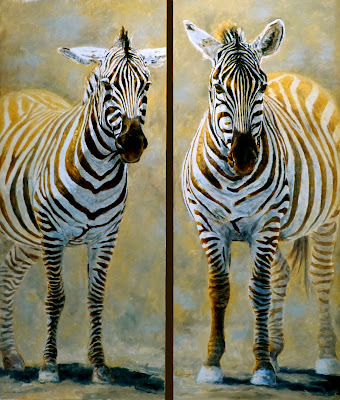 It will be going to my next show, Safari Club International in Las Vegas February 5th - 8th. I am curious to see what reception it gets. Each will be framed separately using the same moulding.